Storm at Sea Top Finished! I finished my Storm at Sea top last night. Not the best piecing job, but hey, it’s done. I did discover that those points really do match up much better if you take the time to put a pin in them! LOL! Who knew? 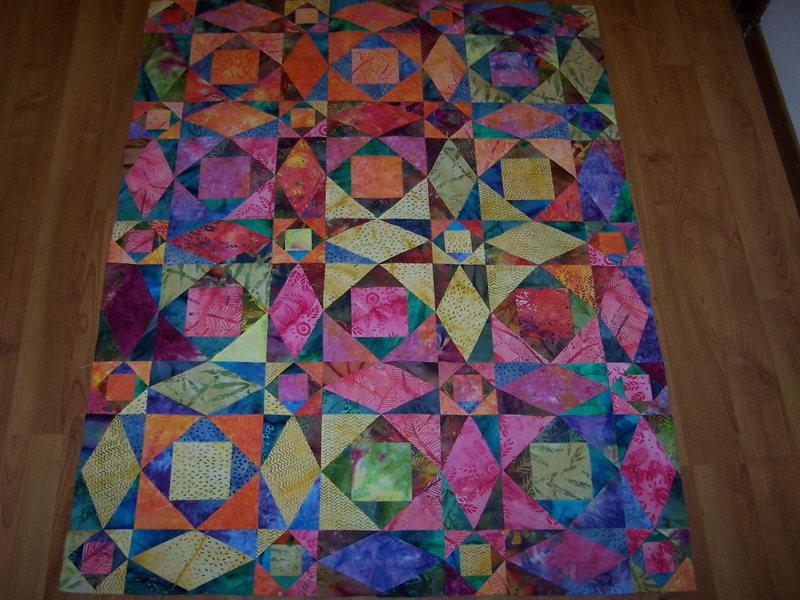 This one will be challenging to me when it comes quilting time. I am running way late this morning, and have to drive to our Borger office for work today. Firearms inspection and requalifying is today. So no sewing on my lunch break today. 😦 Guess I better run! It’s really pretty! This is on my list of patterns to make “some day”. I love all of the bright colors in yours. Very pretty Randi. Can’t wait to see it quilted. Randi, that turned out beautiful!!! Thanks for sharing it!! And good luck requalifying!! I hope your day went off with a bang! LOL, I know bad joke. The quilt looks great. Yea! I’m back in town and I passed my requalification. Good to go for another year! I love it!!! I love how the colors flow. Pretty Randi. Is that a John Flynn kit? I did one too, if it is. I put a panto on it because it was so busy, and because it was for my Bizzy granddaughter. Looking forward to seeing how you quilt it. Oh, my! What a gorgeous Storm At Sea, Randi. Those batiks really make that pattern move. Thanks! It is a John Flynn kit, Gayle. Got it from Wilma & Jim. I would still be cutting out the pieces. It made it really fun to put together. Gorgeous!!! Very nice work, Randi. Looking forward to seeing it quilted. Very pretty!! Congratulations on requalifying! I love the quilt, I have made a couple of them over the years. What I love about them is the “hearts” that appear. Congrats on requalifying. My is teaching our 9 year old how to shoot. He does real good shooting the black birds around here. I’ve enjoyed your blog…. love those caterpillars on the dill. Here in Southern California I’ve got butterfly weed planted for Monarchs. I’ve also thought about buying some dill for the Swallowtails. We had one hatch here next to my front window, and I hadn’t the faintest idea where that fat caterpillar had come from! I am so glad you are enjoying my blog. This blogging is really quite fun. I’m not the most entertaining person, but I’m trying! Well what an inspiration your Storm At Sea is.Its superb! I have lots and lots of batiks and was waiting for a pattern to put them to good use.So now I know what I will do with them can’t wait to get started. So sorry, I haven’t been blogging lately and missed this. But yes, it was one of his precut kits. Thank you for the nice comment.